Download EvBatMonfor iOS now from iTunes. ​Passionate about getting the most out of your Mitsubishi iMiEV / Citroën C-Zéro / Peugeot iOn? * Access the internal information on your iMiEV/C-Zéro /iOn in a simple to use App! EvBatMon needs a WiFi OBD adaptor (check our list below) Note EvBatMon does NOT work with OBD that only support ST1170 commands. While you’re waiting for your adapter to arrive, you can experiment with Emulation mode to play and pre-configure EvBatMon without a connection to your iMiEV / C-Zéro / iOn. EvBatMon comes pre-configured with a range of screens however you can customise everything like gauge size, type (number, dial, LED bar, histogram etc), position and colour. If you have any problems or suggestions let us know because we want you to love EvBatMon as much as your iMiEV / C-Zéro / iOn. We’re passionate about getting the most out of our (and your!) 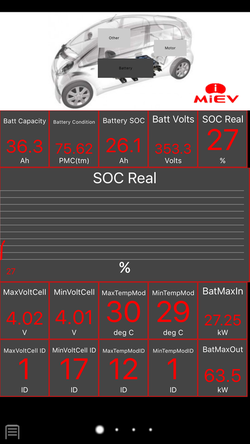 iMiEV / C-Zéro / iOn, so we have many new features under development! EvBatMon for iOS supports all iPhones, iPads and iPods with iOS version 7+.